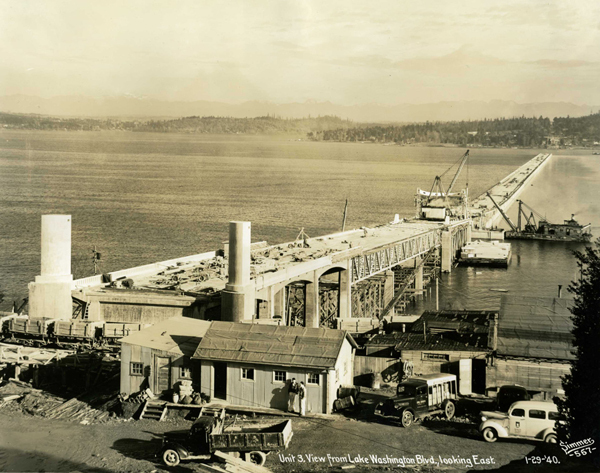 Many of the people traveling across one of Lake Washington’s floating bridges likely take the innovative spans for granted, but when the lake’s very first floating bridge opened to traffic on July 2, 1940, it was the culminating moment of a remarkable engineering feat. Known as the Lacey V. Murrow Bridge, it was the largest and longest floating bridge ever built at that time, and it was the first to be built with reinforced concrete. (It was also known by many as the first I-90 floating bridge.) When it opened, the bridge represented one of “engineering’s greatest triumphs,” in the same category as Boulder Dam and the Golden Gate Bridge. Construction began on the Murrow Bridge on January 1, 1939. This photo, from the Washington State Department of Transportation Photograph Collection, was taken on January 29, 1940, nearly 71 years ago to the day. It was rebuilt after part of the bridge sank on November 25, 1990, with the refurbished bridge opening on September 12, 1993. Construction on a second I-90 floating bridge began in April 1986 and was open to traffic on June 4, 1989. That span is known as the Homer Hadley Bridge. For more historical info on the I-90 floating bridges, check out these documents from WSDOT here and here. My name is Marcel Gerritsen and I am a student at the Delft university of Civil engineering (The Netherlands). Currently I am busy with my thesis which is about floating bridges. With this Email I would like to request more information regarding the original Lacey V Murrow Memorial bridge which you might have available. The information will be used for a literature study and its source well mentioned. The specific point of interest is related to the structural design (size, shape, dimensions of pontoons etc.). Perhaps some drawings are digitally available or maybe some projectspecifications.